Ten days ago we welcomed our beautiful little C into the world. We had a repeat c-section scheduled for Monday, October 8th, but she had different plans 🙂 I woke up around 2 AM Friday, October 5th with contractions that felt stronger than the Braxton Hicks I’d been having for a long time. I started timing them (there’s an app for that 😉 and they were about 7-8 minutes apart. I tried to sleep for a few hours, but the contractions kept waking me up. Finally, around 5 AM I got up and took a shower hoping the warm water would calm the contractions. When I was up moving around they got stronger and closer together. I called my doctor and she said to drink a lot of water and get some rest. So, I did just that. When I was resting the contractions would slow back down to every 7 minutes but the moment I got up they got a lot closer (every 4-5 minutes). With L, I had a ton of contractions for 48 hours before she was born and they weren’t progressing labor very quickly, so I didn’t want to go to the hospital just to be sent home. I had my last check-up appointment at 1:15 so I thought I would wait and go to that appointment and see what my doctor said. Fast forward through a rough morning where I let L watch 4 movies in a row just so I could be on the couch resting. When Matt got home from work around 11, I was close to tears and then when I got in the car to head to the doctor I was bawling talking to my best friend on the phone. I was in a lot of pain and now the contractions were coming faster. I drove myself to the doctor (because L was down for her nap and any mom of a two-year-old will tell you that you don’t mess with nap time) and I had to pull over four times for contractions. When I got to the doctor, I think they all took one look at me and went and got my doctor. I was in the room for about 3.5 seconds before she came in. When I had to breathe through a contraction, she said, “We better check you out.” One minute later she said, “You’re 4 cm dilated and in active labor. You’re headed straight to the hospital.” I sat straight up as I realized this meant we were about to have our baby. I just knew she was going to tell me that I was still only 1 cm so this threw me for a loop. I called Liz to see if L could come over to her house and Matt to tell him to meet me at the hospital. Five minutes later I was at the hospital and they were prepping me for surgery. It had only been about 45 minutes since my doctor examined me, but they said I was probably around 7 cm and my contractions were every 2 minutes. And I was in a LOT of pain. After they got fluids and antibiotics in me, we were headed up to the OR. And I got a special blessing because my good friend Lauren showed up to come on her nurse shift at 3 PM right before we headed up to the OR. She got to be with me the whole time and having her there was a huge blessing and put me at ease. After getting in the OR, I got my spinal (o happy day! ), they put the curtain up and Matt got to come in. Lauren asked Matt if he wanted to announce what the baby was… boy or girl. So, just a few minutes later Lauren told Matt to stand up and he got to announce to everyone, “It’s a GIRL!! !” Matt and I both started bawling and I heard that beautiful sound of our baby girl crying for the first time. Not finding out the gender was even more fun the second time around, and I’m so glad we did that for both our girls. While they were stitching me up, Matt got to hold little C and we were all just chatting away. 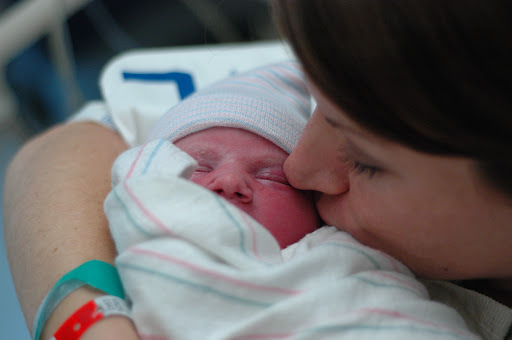 It was a very different experience from my emergency c-section with L where she was pretty quickly taken to the NICU because of her raised heart rate and slight fever. We got to keep C with us the whole time and I was really grateful for that. After a couple hours in recovery, calling all our family to tell them she was a girl, we went up to our room. As soon as my mom got in town (she threw her bags in the car as soon as I called telling her I was headed to the hospital) she went to pick up L from Liz’s house and bring her to the hospital. That first night she was really concerned about me because I was still hooked up to the IV and everything, but the next day she came back and all she could do was kiss little C all over. She is the best big sister and I am loving having two girls. I’m also very happy little C came on October 5th because that is the anniversary of the date Matt and I started dating 11 years ago 🙂 A very special day before and now infinitely more special. Welcome, little C. You are such a miracle and a blessing from God. We love you so much!